It would be perfect to say that Atkinson always knew he wanted to be a drummer, but it also wouldn't be true. Born on October 14th, 1982, young Andrew was fixated on being an artist right up until the age of 14. Music barely even registered in his life; when he wasn't drawing, he was playing video games. "I got into music byaccident; my art school messed up my schedule and put me in percussion class," remembers Atkinson. "Once I got those sticks in my hands and started playing I knew that's what I wanted to do for the rest of my life." A new dimension opened up for him. "I barely listened to anything other than jazz for the entire time that I was in high school," says Atkinson. "I fell in love with Elvin Jones and Max Roach; those were the first cats that really did it for me." Over time, he'd start experimenting with the rhythms of his island homeland, and by his senior year, he was occasionally playing with the renowned New World Symphony under the direction of acclaimedconductor Michael Tilson Thomas. Already, a wide array of influences was taking hold of him. 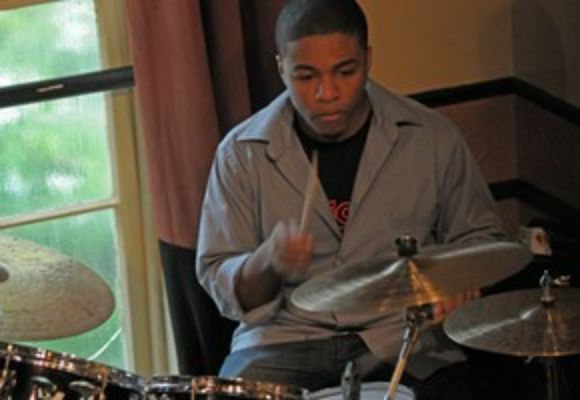 After graduation, Atkinson would find himself becoming one of the most in demand young drummers in Miami, playing with every type of band imaginable. With reggae-ska band The Monjees, Atkinson got his first taste of lifeon the road by performing on the 2002 Warped Tour and opening for James Brown at the 2002 Sunfest. Of course, he stuck close to jazz, his first musical love, and wound up doing gigs with luminaries such as Randy Brecker, Arturo Sandoval, Danilio Perez, and Donald Harrison. In 2006, Atkinson became the drummer for Othello Molineaux, former steel pan player for the late, legendary bassist Jaco Pastorious. More importantly, 2006 was when all of Atkinson's many influences came together in the form of the Andrew Atkinson Quartet. Featuring musicians from all over the globe who are just as comfortable with all kinds of amorphous rhythms, Atkinson's Quartet is a true extension of his international zeal. Classics such as Miles Davis's "Blue in Green" become slinky gems peppered with shuffling reggae drums, woozy sax lines, steady bass and off-kilter piano. Theoriginals are even more adventurous, with hard bop energy shooting through elements of Latin, R&B, deep funk and even drum n bass. Radical reinvention isn't the only play in the quartet's book however, and the group demonstrates its love for pure jazz by playing it straight ahead - but no less spirited - when the time is right. "I'm very lucky to have this amazing, crazy, talented group of musicians in my band," says Atkinson. "I can bringanything to the table and we come together and make it sound easy. I truly believe we can get all kinds of people excited about jazz."